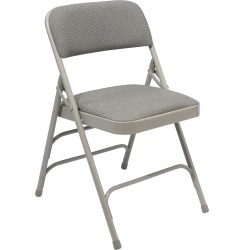 Fabric Folding Chairs - National Public Seating 2300 Series Chair with Triple Bracing - 80 pack. Price includes shipping for these folding chairs when shipped to the lower 48 United States. Get one of the most sturdy fabric folding chairs out there with the 2300 model from National Public Seating. This model features triple bracing in the leg structure for optimal weight support and durability. These chairs can hold up to 480 lbs. and have a foam and fabric seat that are Cal 117 rated. The Scotch guarded fabric is rated at 30,000 double rubs so your fabric chair will continue to have an outstanding look after repeated use. These fabric folding chairs ship in a pallet load of 80 chairs. Folding Chair Dimensions: 29.5 inches H x 18.75 inches W x 20.75 inches D.
Features 3 U-shaped, double riveted cross braces for optimal weight support. Double hinges on each side for added stability. Full-size, double-contoured back and waterfall seat. Fabric rated at 30,000 double rubs. Fabric and Foam are Cal 117 rated. Holds up to 480 lbs. Available in the following color schemes: Beige/Beige, gray stone/gray, Imperial Blue/Blue, and Majestic Cabernet/gray. Why order a triple-brace folding chair? The bracing referred to hear is the bracing behind the chair on the back to legs. That bracing is there to support the backwards motion experienced during the act of sitting. That motion can put a lot of stress on the back legs and by adding that additional brace (as compared to a double-braced chair) the chair has added reinforcement for those sitting down. The 3 braces in a triple-brace folding chair are the 2 braces in the back of the chair and 1 brace in the front of the chair (a double-braced folding chair has 1 brace in the back and 1 in the front). This type of design is particularly well suited for users that need added support in their chair to avoid the chair crashing down. If you need a chair for lighter use, please take a look at our Double-braced folding chairs. Q: Where can I find a storage cart for these chairs? Fast Shipping: Orders for the National Public Seating 2300 (80 Pack) generally leave the warehouse within 2-4 business days. Accurate Tracking: Tracking information is emailed to you after the order ships out. Delivery Details: This product ships directly from the warehouse in , . This item generally ships via a curbside delivery through an LTL carrier (too big for UPS and FedEx). The customer must be present to sign for the order. The freight carrier is instructed to contact you prior to delivery to set up a delivery appointment. Signing for the Package: When signing for the delivery it is important to note any damage. Damage is extremely rare. The products are packaged to travel both domestically and internationally. However, sometimes the packaging may be slightly damaged, but you may not be sure whether something inside is damaged. In such a case it is a good idea to sign for it and have the driver note it as such. You can still accept delivery. Call or email us with any questions. Local Pickup Option: This item may be available for local pickup in , . If you are interested in picking it up locally contact our customer service for a super cheap pickup quote at 866-308-5484. Dimensions: 48" x 48" x 30"